We are proud to announce a brand new partner in crime: DUNGEONFOG and Foundry Virtual Tabletop band together! We are excited about future joint efforts to innovate RPG game playing and storytelling. To honor our new partnership, we have set up a promo discount for all new DUNGEONFOG premium annual subscriptions: With the promo code FOUNDRY, users now get 10% off! 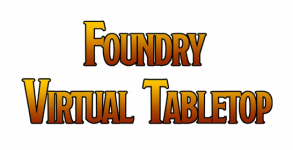 Foundry Virtual Tabletop is a new application for organizing and running tabletop roleplaying games. The intuitive web-based application is still in development - interested players can get access to either the alpha or forthcoming beta version by becoming a Patreon. A warm shout out to Moerill, who created a plugin enabling a smart import of DUNGEONFOG lighting borders into the Foundry VTT system. This initiative helped to connect the two innovative systems for RPG experts and newcomers alike. With a little encouragement from members of our DUNGEONFOG community, the German computer science student created a plugin that utilizes our SVG export to detect walls and other barriers. The automatic assignment of light blockers, such as walls and doors, dramatically reduces the retouch work required when importing DUNGEONGFOG maps into Foundry VTT.